Did I just use the words ‘healthy’ and ‘chocolate’ in the same sentence? Yes I did. That’s right, these tasty treats are full of nuts, are gluten free, refined sugar free and dairy free (depending on whether cacao or chocolate is used) and yet, when you bite into one, all you can taste is sweet chocolate decadence. Now I’m not health food obsessed (I don’t need an excuse to eat dessert or chocolate!) but I do appreciate healthy food and believe that a balanced diet is important, so I will try and eat and explore healthy alternatives where possible – That’s where these sorts of recipes are so good, you can feel good about eating something that tastes naughty! The sweetness comes from the dates. 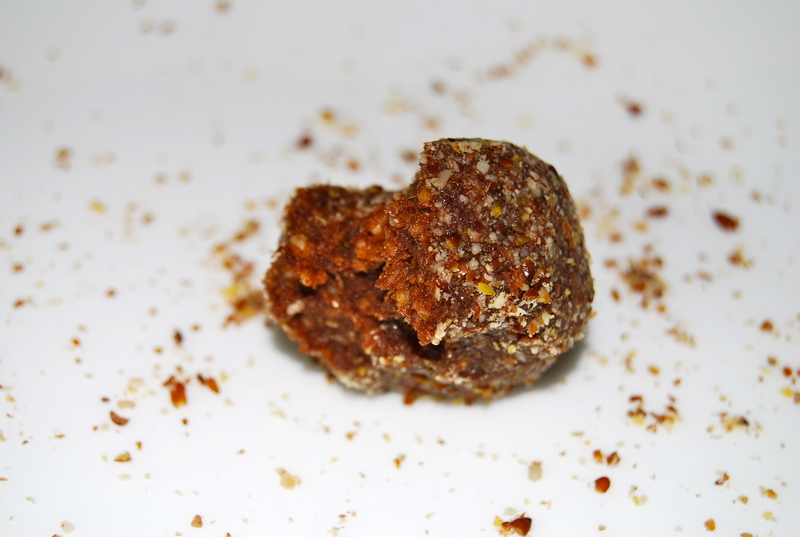 I’ve come to appreciate dates a lot and in my recipe (among many other truffles recipes) they are used as a great alternative to refined sugar. Yes, that does mean they are naturally high in their own sugar content, so like everything they too need to be eaten in moderation, but they’re better for you than refined sugar and also come with a huge amount of health benefits. It’s not like I need to sell this recipe to you (just look at those truffles!) but while we’re on the topic here are just a few things that dates are good for: Relieving constipation and supporting regular bowel movements, reducing heart disease risk, iron-deficiency anemia, reducing blood pressure, promoting respiratory and digestive health, hemorrhoid prevention, chronic conditions such as arthritis and preventing colon cancer. There you go, healthy, super tasty and really easy to make! What are you waiting for? Note: LSA is a mix of ground Linseed, Sunflower and Almonds. If you don’t have LSA on hand you can use coconut instead. Use any type of chocolate (or chocolate flavour replacement) depending on what you have on hand and/or your health requirements. 1/3 cup 70% cacao dark chocolate, chopped (or use cacao nibs or 1 tbspn cacao powder for a dairy free, sugar free version). Place all ingredients EXCLUDING the LSA in the food processor and process until a biscuit dough consistency is achieved (add more water for a thinner consistency or thicken by sprinkling in LSA until you reach your desired consistency). Place LSA in a separate bowl. 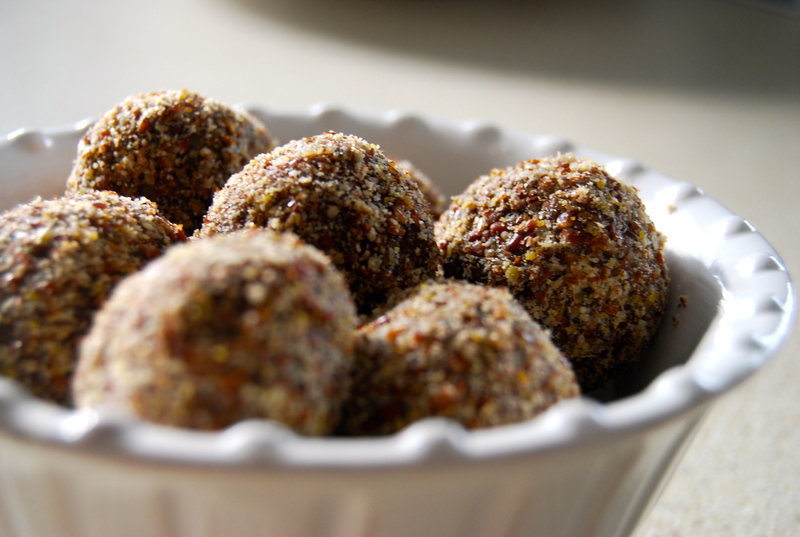 Using clean hands, roll teaspoons of the truffle mixture into balls, then roll each ball in the LSA. Place the balls in the fridge to harden. Serve with tea or coffee, or have on hand for a tasty sweet snack during the day! Truffles keep well in the refrigerator for up to a week. Hubby would have enjoyed those in his lunch box !